Built with beauty and comfort in mind! Welcome to Manzanita Oasis Upstairs back deck. Unobstructed view of the wilderness preserve Upstairs deck view overlooking the wildlife. Stairs go to lower deck. Beautiful deck to enjoy coffee in the morning or just a place to relax and watch wildlife. Manzanita Oasis located in north Manzanita Neah-Kah-Nie Manzanita Oasis is situated on a very private lot surrounded by trees. Beautiful foyer with large area for shoes, coats, and your beach things. Spacious kitchen with plenty of cabinets, counter space and more. Granite countertops with a large island. Island with built in microwave. Excellent area to cook and bake Dining table seats up to 10 Great living room with wood burning fireplace and a flat screen TV, cable, dvd player. Large flat screen TV with cable and dvd player. Great views from every window in the house Upstairs half bathroom Library is off the living area. Great reading nook or just a place to enjoy the sights. Another view of library, there is a secret passage way from this room that leads to a tiny deck with ocean views. Views from secret deck off the library. Upstairs King Bedroom with wonderful linens, tv and cable. Master on-suite bathroom with full tiled shower in King bedroom. Another view of master bathroom Go downstairs for queen bedroom with bunks. Spacious room with flat screen tv and more. Downstairs bunkbeds. These are in the room with the queen bed. Another view of bunks Downstairs bathroom with shower built-ins and plenty of plush towels This is the same downstairs bathroom just a different view. Shared between bunk/queen room and full room. Full bed in its own window alcove. Surrounded by windows and no neighbors in sight. This spot to sleep and sight see will be the most favorite if the library is occupied. Close up of reading nook Downstairs laundry room is large with slop sink to rinse out clothes. Please leave us your comments when you stay in this amazing home. Back of Manzanita Oasis. The decks are an amazing place to overlook the nature area. Have a cup of coffee at the end of the dock Manzanita Beach is less than 5 minute walk from the house. An architectural gem featured on the Manzanita Tour of Homes, this three bedroom Manzanita vacation rental is a nature lover's dream. This home is located a block from the uncrowded beauty of Manzanita beach and a pleasant, half mile stroll to the boutiques, galleries and restaurants in downtown Manzanita. Situated on the edge of a wilderness preserve, the house echoes its beautiful surroundings: warm wood beams and hardwood floors, a private boardwalk through the surrounding wilderness preserve, and beautiful views from every room. Upstairs, the film buff will feel right at home in the living room. Stoke a fire in the wood-burning fireplace, sink into one of the plush sofas, and select a movie on the flat-screen cable HDTV. The bookworm will find it hard to resist the beautiful library. Raised just a few steps above the living room, this cozy spot is lined with bookshelves and has a window seat that overlooks the ocean and wetland. On cloudy days this is the place to watch the storms roll in. The house is also equipped with wireless Internet, and this reading room makes an ideal office for those who need to stay connected. The cook will adore the kitchen; a bright and airy space with vaulted ceilings. There are stainless steel appliances, plenty of counter space, all the equipment needed to prepare meals, and even an island where the would-be assistants can sit with a glass of wine and keep the chef company! A dining table next to the kitchen seats eight, with an upholstered wraparound bench and three chairs. The dining nook has tall windows overlooking the wildlife refuge, so you might spot an unexpected visitor wandering into the yard while you enjoy your dinner. The Master bedroom boasts a dream-inducing king-size bed and is accompanied by a lovely en suite bathroom. However, downstairs, the second bedroom has a full-sized bed in its own special sleeping alcove, so this lucky sleeper (or two) can enjoy spectacular views from bed! The third bedroom, also downstairs, has a queen bed and a set of two twin bunk beds. You can also watch TV or view the wetlands through the sliding doors that lead to a private lower deck. Kids will love being able to play on the deck with a close up view of all the wetland wildlife. The lower level also has a full bathroom and a laundry with washer and dryer. The house has several ways to enjoy the outdoors right on the property. In addition to the lower deck off the bunk room, there is an upper level deck with a dining set and a stainless steel gas grill. A staircase leads down to a wooden boardwalk, ending in a lovely patio with Adirondack chairs overlooking the wildlife preserve. Manzanita Oasis does not allow smoking or pets of any kind. 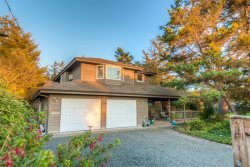 Come enjoy this beautiful home on the north Oregon Coast! Open concept living on the main level upstairs. blender, hand mixer, and crab pot etc. Always so helpful & friendly! Great deck & awesome view of the trees! So relaxing to sit there & watch the world go by. We had a fantastic spring break at the beach. 1 mile walk or drive to town & a 5 minute walk to the beach. Great amenities & comfortable all around. Highly recommend!!!! Was very easy to interact with the team. Communication was very good throughout the process. This is one of the best properties in Manzanita. Everything is top-quality. Tell us about your favorite feature of the property. The room next to downstairs porch...it became our nap room. We stayed at this same house in Summer 2015 and loved it. It's been a dream of mine to return with the entire family-- which just came true. The beautiful architectural features, color scheme, comfortable beds, deck, proximity to the beach, and especially-- the reading nook with windows on all sides. This property was the nicest house I have ever stayed in on the coast. It was a dream come true. We will definately stay here again! Easy access to the beach, peaceful home, very clean, comfy beds and the library were our favorites! Loved this house! It is like a cabin in the woods and a beach house in one. The library was great for games after the kids went to bed. The deck was great for enjoying the sun.